Find out what our experts have to say about Royal Enfield Classic 350! Royal Enfield has launched the latest ABS version of its best-selling bike, the Classic 350, in gunmetal grey shade. The latest ABS version is Rs 20,000 dearer than the existing variant. The company has planned to upgrade all its bikes with ABS before the government’s deadline, 1 April 2019. The dual-channel ABS operates on 280mm front and 240mm rear discs. There have been no changes on the mechanical front and the retro-styled machine continues to draw power from the 346cc, single-cylinder, air-cooled engine churning max power of 20PS and peak torque of 28Nm, mated to a 5-speed gearbox. Royal Enfield claims that the Classic 350 returns a mileage of 37kmpl. In addition to the standard variant and the gunmetal grey variant, the Classsic 350 is also available in Stealth Black and Signals edition. The gunmetal grey variant with ABS is available at Rs 1.62 lakh (ex-showroom Delhi). The Classic 350 stands to compete with the Bajaj Dominar 400, the UM Renegade range of cruisers, the Yamaha FZ25 and the Mahindra Mojo 300. The least priced variant is Royal Enfield Classic 350 STD priced at Rs. 1,66,090 and the most priced variant is Royal Enfield Classic 350 Signals Edition priced at Rs. 1,85,583. Choose the Royal Enfield Classic 350 which fits the bill of you. The Royal Enfield Classic 350 is the best-selling motorcycle from the iconic bikemaker and takes a place among the top 10 best-selling bikes in India. The reason behind that is its true retro styling and a thumping 350cc engine which makes it a good option for vintage motorcycle fans. While appealing classic motorcycle enthusiasts, the motorcycle meets BS-IV emission standards and the company has recently added a rear disc brake option as well. Alongside the standard variant, Royal Enfield also offers the classic 350 in Stealth Black, Gunmetal Grey, and Signals editions. Price of the range starts at Rs 1.39 lakh and goes up to Rs 1.62 lakh (ex-showroom, Delhi). Based on the price and purpose, the Royal Enfield Classic 350 competes with the likes of the Bajaj Dominar 400, UM Renegade range of cruisers, Yamaha FZ25 and the Mahindra Mojo 300. However, it is going to get a direct competitor very soon in the form of a new Jawa motorcycle which will be unveiled next month. 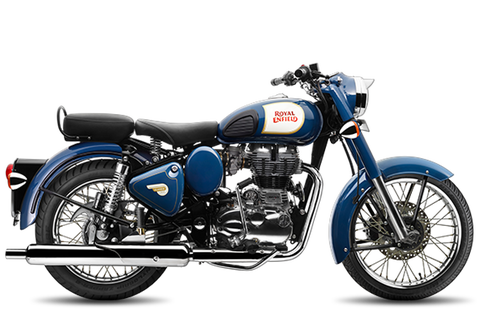 Royal Enfield Classic is the only retro-styled motorcycle bike in its respective price segment. Its classic charm starts with a chrome surrounded round headlamp which gets a chrome hood as well. The headlamp takes its place in a classic style nacelle which also houses an analog type instrument cluster that offers speedometer, fuel gauge, and an odometer. The handlebar of the motorcycle is the street type and the motorcycle also gets a classic teardrop shaped fuel tank which has a capacity of 13.5-litre. The Classic 350 is based on a single downtube frame, using the engine as a stressed member. The front telescopic forks of the Classic 350 comes with a painted inner fork tube cover which further provides the bike with a masculine appeal. It has retro styled side panels and mudguards as well and all of them have been made from metal. The all-metal body construction provides the bike with a noticeable kerb weight of 192kg. The Classic 350 has a wheelbase of 1,370mm and a ground clearance of 135mm. The length, width, and height of the motorcycle are 2,160mm, 790mm and 1090mm respectively. Chrome finish has been provided on the exhaust muffler, round rearview mirrors, and the classic wirer-spoke wheels. Another highlight of its vintage styling is the classic style, spring suspended front seat and a separate rear seat. Completing the classic appearance is a vintage style tail lamp housing with flanked round turn indicators. The standard variant is available in seven colour options -- Ash, Chestnut, Silver, Black, Redditch Red, Redditch Green, and Redditch Blue. Other variants further add four colour options - Stealth Black, Gunmetal Grey, Airborne Blue, and Stormrider Sand. The Royal Enfield Classic 350 gets a 346cc single-cylinder air-cooled engine with twin-spark technology. The long-stroke mill churns out 20bhp of power at 5,250rpm and a peak torque of 28Nm at 4,000rpm. The engine comes mated to a five-speed gearbox via a conventional wet multi-plate type clutch assembly. The company claims that the motorcycle has a top speed of 130kmph and the massive torque makes it capable of doing a 0-100kmph sprint in 13.2 seconds. The Royal Enfield Classic 350 comes with both kick and electric start. The company claims that it returns a fuel efficiency of 37kmpl which provides the bike with a range of around 500km in a full tank. The Royal Enfield Classic 350 gets 35mm telescopic forks at the front with 130mm travel. The rear comes suspended on twin gas-charged shock absorbers with five-step adjustable preload and 80mm of travel. The standard variant comes with 280mm disc brake up front and a 153mm drum-type brake at the rear. The Stealth Black and Gunmetal Grey variants, and Signals edition also get a 240mm rear disc brake for better stopping power. The Signals edition further comes with a dual-channel anti-lock braking system (ABS). The Classic 350 runs on 19-inch front and 18-inch rear wheel, shod with 90/90 and 110/90 section tyre respectively. The Stealth Black variant gets a wider 120/80 section rear tyre. The Classic 350 remains a true classic in safety as well and boycotts most of the modern features besides the disc brakes. The company has also introduced ABS recently but is offered in its Signals edition only. However, the company will expand this feature across the range soon. After the government's mandate, the bike also comes with an always-on headlamp as well.